Sir Bradley Wiggins is not entering the inaugural Tour de Yorkshire to win it but plans to go on the attack. Britain's first Tour de France winner is among 144 riders in the three-day race, which starts with Friday's 174km stage from Bridlington to Scarborough. "I'm not coming here trying to win this," said Wiggins. "But I feel liberated. I can have a go." Saturday's 174km second stage runs from Selby to York, with Sunday's 167km finale from Wakefield to Leeds. Wiggins, the reigning Olympic and world road time-trial champion, is competing for his newly-formed Team Wiggins. "I'm coming here to do a job for the younger guys in my team who are really up for it," said the former Team Sky rider. 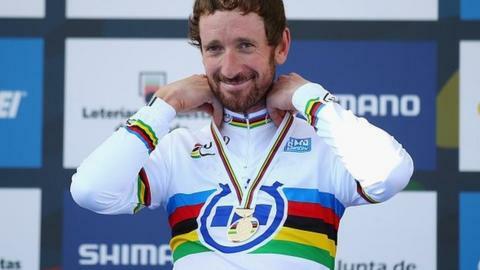 The 35-year-old Englishman, who has also won four Olympic and six world track titles, added: "I'm perhaps not the Bradley Wiggins of 2012. I'm 10 kilos heavier with a doppy beard." Race organiser Gary Verity said fans should turn out to "salute one of our nation's greatest champions", adding: "You are coming to see a piece of history so bring the kids and grandkids." The Tour de Yorkshire, from 1-3 May, is likely to be one of his last on the road as he switches focus to trying to break the legendary hour record on 7 June and then qualifying for the British Olympic track team for Rio 2016. Sixteen teams, made up of eight riders, will compete in the race, which was born out of the success of last year's Tour de France Grand Depart. It has been billed as a stage for the sprinters with the finish on the promenade of the east coast seaside town. However, numerous short, sharp climbs as the race winds its way through the North York Moors and a final one away from Robin Hood's Bay, 28km from the finish, could put pay to the hopes of the pure sprinters. A few lumps and bumps early in the stage through the Yorkshire Wolds are unlikely to stop the prospect of a big sprint for the line given the flat finish that three laps of a circuit around York offers. Much of the route takes the riders on the roads used in last year's Tour de France, albeit in reverse, as the race heads to Haworth via Holmfirth. With six categorised climbs and a fast finish into Leeds, there could be a shake-up in the peloton meaning it's difficult to predict whether it will be a mass sprint for a line, or a smaller, more selective bunch. If not Wiggins then who? Ben Swift, a Yorkshireman who leads the eight-man Team Sky squad, says the race is "a massive goal". The rolling nature of the terrain may suit the 27-year-old, who should cope with the hills better than the pure sprinters and has a turn of pace that can beat the climbers on the race to the finish line. "I don't think a pure sprinter can win," he said. "But I think someone who can handle the punchier climbs quite well might." Swift is wary of the threat a "liberated" Wiggins could pose. "We know what he can do," he said. "Everybody knows you can't give him any room. If he gets 10 seconds, you won't see him again." How will the non-Brits do? Swift suggests the course should also suit Belgium's Greg van Avermaet, the BMC Racing rider "who can climb a bit better". Look out, too, for France's Thomas Voeckler. The 35-year-old Europcar rider, a veteran of 12 Tours de France, may find Sunday's hilly stage to his liking. Marcel Kittel, the German sprint specialist, returns to Yorkshire after winning the opening stage of last year's Tour de France in Harrogate. However, it is his first race back after three months out ill.
"I'm not super fit after being sick," he said. "But at least it's a start. I'm not focused on any special goals." There will be a four-lap 80km women's race around York which will precede the men's race on Saturday. Paralympic and Olympic champions, including Dame Sarah Storey and Joanna Rowsell, are among 97 riders taking part.